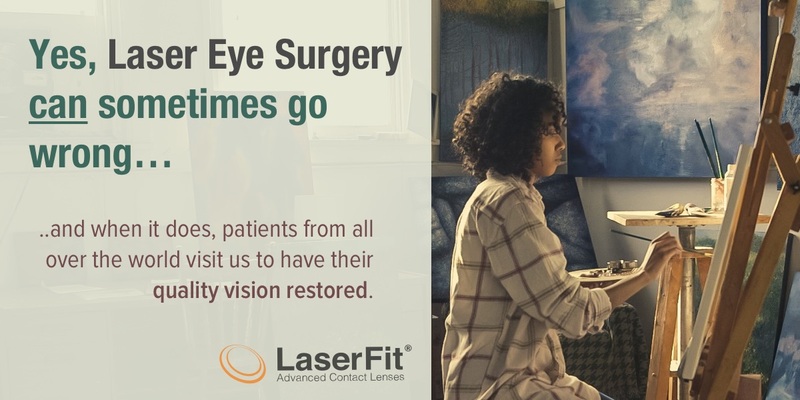 LASERFIT : The perfect solution for LASIK, PRK, RK, SMILE laser eye surgery gone wrong. A little more than a decade and a half ago, we started working on how to best help patients who were left with permanent problems after laser eye surgery. These patients were experiencing problems they had never experienced before. In dim lighting, and especially at night, they would be experiencing dreadful glare, starbursting, halos, and double vision. Ironically, many of them would still score decently well on the standard eye chart which does not take into account any of these bad side effects. Why was laser eye surgery causing this? At the time, we had to learn a whole new vocabulary of terms to describe these phenomena: higher order aberrations, spherical aberration, coma, irregular astigmatism, trefoil, etc. But what does all that mean? The patients went in with nearsightedness, farsightedness, and astigmatism, but came out with these other things. Basically, these were terms used to describe common types of distortion in lenses and lens systems, but we were now using them to describe human vision. These were the things that were now causing the patient’s distorted vision but could not be measured in the regular eye examination. Eyeglasses and regular soft contact lenses couldn’t fix the problems. In some instances hard or rigid lenses could help somewhat. Unfortunately, the eyes were now shaped differently. Where previously a healthy eye used to be steeper in the center and flatten in the periphery, many post-Lasik eyes were now shaped the other way around after laser eye surgery. A new type of lens was needed to fix the problems. Initially, we went about developing new lenses to fit these newly shaped eyes, using local manufacturers who were willing to pitch in and help. The first attempt was a kind of oversized hard lens, called a reverse geometry intra-limbal lens. This proved to be a dramatic improvement and actually moved us to the top of the heap in terms of being able to provide a reasonably comfortable solution. Unfortunately, we would find out all too soon that these lenses had limitations. Most of these new patients had two things in common: large pupils and dry eyes. Our new intra-limbal lenses were not the ideal solution for that. We needed something larger to sort of vault the cornea and rest on the white part of the eye. There was a new lens available locally that seemed just what we needed. It was called the Macrolens, and we moved up another notch in terms of addressing more of the problems and helping more patients – even if not ideal. So our search continued for a better lens to manage the severe dry eye that we were encountering. This led to Truform Optics and their newly available scleral lenses. Being larger they could accommodate large pupils and hold a larger volume of liquid against the eye. Simultaneously we came to the realization that eyes were just too diverse for a one size fits all lens, and we had the idea that if we could just find a suitable instrument to measure the shape of the eye, we could design a lens to order. There was such an instrument, and it was called the anterior segment optical coherence tomographer, or OCT for short. We acquired one and learned how to take the scans we needed. With the help of Truform, we began to generate measurements for a new type of customized lens. But we weren’t finished. We noticed that some patients still had those nasty higher order aberrations – our new lenses simply weren’t eliminating all of them. How to measure these aberrations? We needed something called an aberrometer, and so we went out and purchased the best on the market for our needs: the iTrace from Tracey Technologies. It could measure any eye, even the most distorted. After a year or so of measuring eyes, we learned how to incorporate those measurements into a brand new aberration-busting lens. We had now entered the age of wavefront-guided lenses. Working with a plethora of detailed custom data points, we would send our designs to Truform for fabrication. Then in 2012, we partnered with Inceptra and Dassault Systemes who designed a custom solution for us so that we could optimally design our lenses digitally in 3D. So, now we can fit any eye and correct virtually any vision problem – whether it’s from LASIK, PRK, RK, SMILE, corneal transplants, keratoconus – whatever. We can fix it typically within one week and often achieve 20/15 or better vision with greatly reduced or eliminated higher order aberrations. It’s been a great privilege for us to meet and help the many people from all over the world who visit with us after being left with damaged vision after poor laser surgery outcomes. So you see, if it wasn’t for LASIK, the Laserfit lens might never have happened.